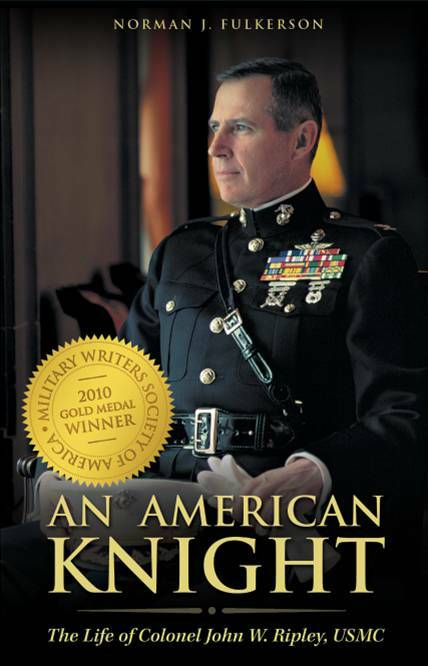 An American Knight received a Gold Medal from the Military Writers Society of America. Ever since the Vietnam War many Americans have noticed the lack of recognition given to true American Heroes. Those covering that controversial war chose to inaccurately portray our soldiers as baby killers and turned a blind eye to the valor many of them showed on the battlefield. Although things have improved a bit since then, one can still detect a hesitancy to recognize the outstanding qualities of the American soldier. This blog is my small contribution to “giving credit where credit is due.” The inspiration for this blog came while researching the life of one such hero, Colonel John W. Ripley. 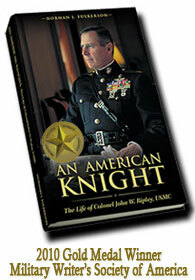 Seeing the military and moral greatest of this man, and the fact that he did not get the attention I think he deserved, is what led me to write An American Knight, The Life of Colonel John Ripley, USMC. When it comes to Modern American Heroes, Colonel Ripley is, in my opinion, the archetype and it for this reason that this blog is dedicated to his memory. But there are others, such as Pat Tillman who gave up a million dollar career in the the NFL to serve his country, and Michael Monsoor who jumped on a grenade to save his fellow SEALS. All of them are gone now but their examples live on. May they rest in peace and may those who follow their example receive the attention they deserve. Do not fail to watch this video of Colonel John Ripley’s funeral! Well done. I have read about your life and your experiences. Thank you.